Our friends are getting together out in Montauk this weekend to raise funds for Waves for Water and, well, enjoy the beautiful weather this weekend. 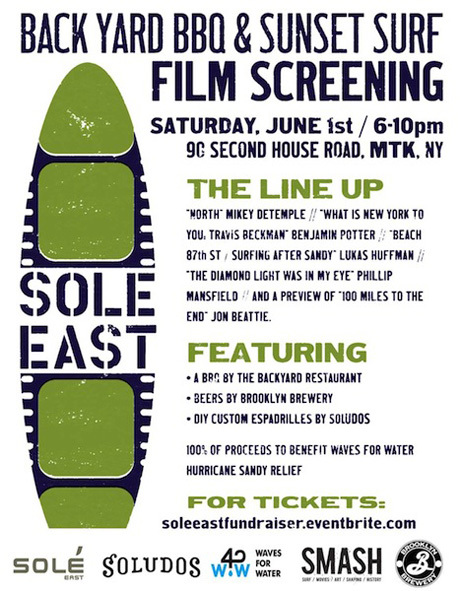 Please come out and support NY/NJ coastal recovery! SMASH will be screening a handful of surf films, including North by surfer Mikey DeTemple (trailer below). See event details and pick up a ticket in advance! If you can't make it out east, you can always support by purchasing a Loomstate Sandy Recovery Tee, 100% organic, 100% donated.